The PDO is defined as the leading EOF of mean November through March SST anomalies for the Pacific Ocean to the north of 20N latitude. For the EOF calculation, the global mean SST anomaly was first removed for each month in order to reduce the influence of the long-term trends in the data. The above plot is of the amplitudes of this EOF in monthly data from 1900 - February 2005. The amplitudes have been standardized and you will have to contact Nate Mantua (mantua@atmos.washington.edu) to find out which years he used to standardize the time series. Positive values indicate months of above normal SSTs along the west coast of the North and Central America and on the equator, and below normal SSTs in the central and western north Pacific at about the latitude of Japan. Fluctuations in this pattern are dominated by variability on the decadal time scale. Nate Mantua maintains a very nice WWW page documenting the PDO. Mantua, N. J., S. R. Hare, Y. Zhang, J. M. Wallace, and R. C. Francis, 1997: A Pacific interdecadal climate oscillation with impacts on salmon production. Bull. Amer. Meteor. Soc., 78, 1069-1079. Zhang, Y., J. M. Wallace, and D. S. Battisti, 1997: ENSO-like interdecadal variability: 1900-93. J. Climate, 10, 1004-1020. The monthly values are the amplitude in each calendar month and year of the PDO spatial pattern. 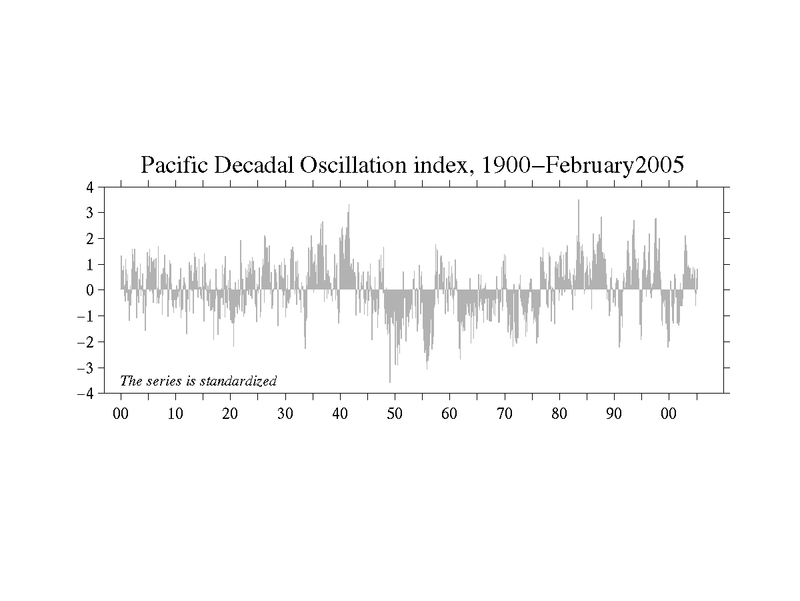 The PDO spatial pattern itself is derived from mean November through March data. 3-column table (year, month, value) not updated regularly. 1-column table (PDO value) not updated regularly.